What is the best to do to take care of your leathers bags ? All the Lady Harberton handbags are made with full-grain cow leather : this is a smooth and resistant leather. The leather will get a nice patina over time. To make it last for a long time, we advice you to take care of it regularly (more or less every three months). 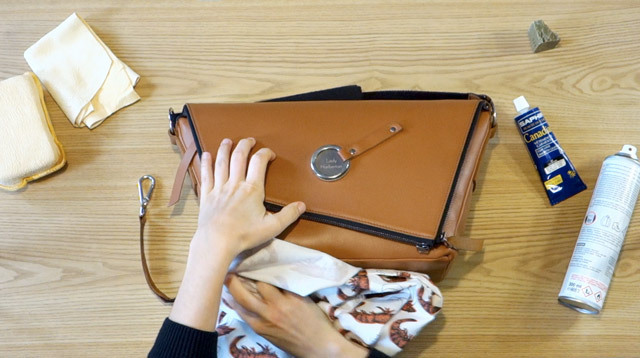 Discover with a video and images here how to take care of leathers bags. A nourishing creamy wax for leather. You can either choose a colorless wax or a colored one if you want to want to shade the imperfections, just be careful to use a colored wax that is the same as your bag. Always remember, that for a smooth leather, you will need a wax and not fat because the fat will stain this kind of leather. On the video and picture, we use the Canadian wax from the french brand Saphir. With a soft towel (like a chamois leather for instance), wipe the surface and all the corners of the bag to get rid of the maximum of dust and dirt. Dilute and mix some soap flakes with hot (not boiling) water and clean the leather with the soapy water and a soft sponge or a soft towel. Remember to be gentle when cleaning, do not to scrub too much the leather. This step is to make sure to remove all the dirty marks and dust particles that could scratch your bag. When your bag is cleaned, rinse your towel with clear water and remove the soap from the bag. 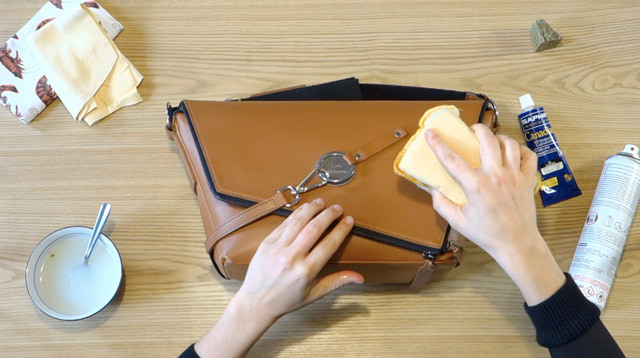 Finally, dry your handbag with a dry towel. Put a small amount of the nourishing creamy wax by spreading it to rub in the leather : on the smooth parts, make circular movement and on the part that are wrinkled, put the wax in the direction of the leather wrinkle, insist on the scratch parts that are more sensitive. You can choose a colorless wax just to nourish the leather or a colored one to shade the imperfections and give back a brightness color to your bag. If you use a colorless wax, take care to put small touch of wax each time and make it really enter the leather to avoid white mark. This step is essential to prevent the leather of drying up and to nourish and waterproof the leather. If you are not sure about the product to use, test it in a hidden part of your bag. Finally, wait 5-10 minutes so the leather can absorb the wax and then remove the excess with the soft towel. Use a colorless waterproofing spray (made for leather) and spray it on your bag in a well-ventilated room with a distance of 30 cm to avoid marks on the leather. 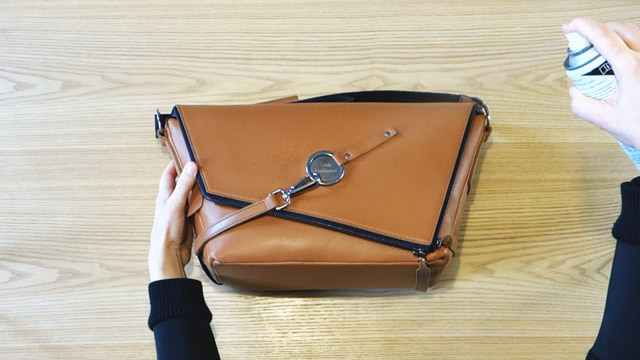 If your bag has some scratches, insist on these areas to protect the leather, just still spray it within a distance of 30 cm. Some advices to make your bag last ! What can I do if my bag has been under water for a long time ? 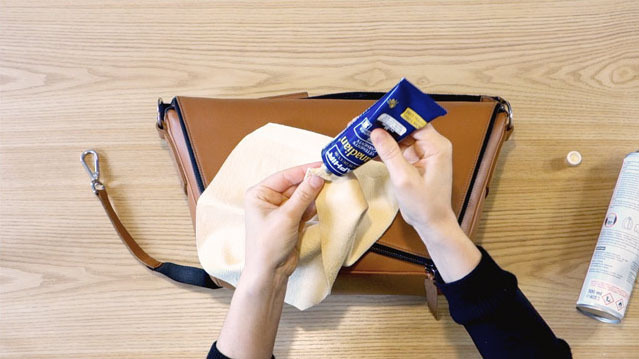 If your Messenger Bag or your Clutch Bag has been under the rain for several hours, don’t dry it on the radiator but dry it with a towel and then make it dry naturally in a dried and ambiant temperature room like your living room for example. How can I store my Lady Harberton bag ? If you don’t use your bag for a long time, you can store your bag in a coton cover or a pillowcase, to protect it from dust. We recommend you also to fill your bag with news paper or silk paper to keep the form of your bag during time. When storing your bag, keep your bag away from the light because the leather can get dry and the color can bleach. The greasy materials like hand cream can stain the leather. 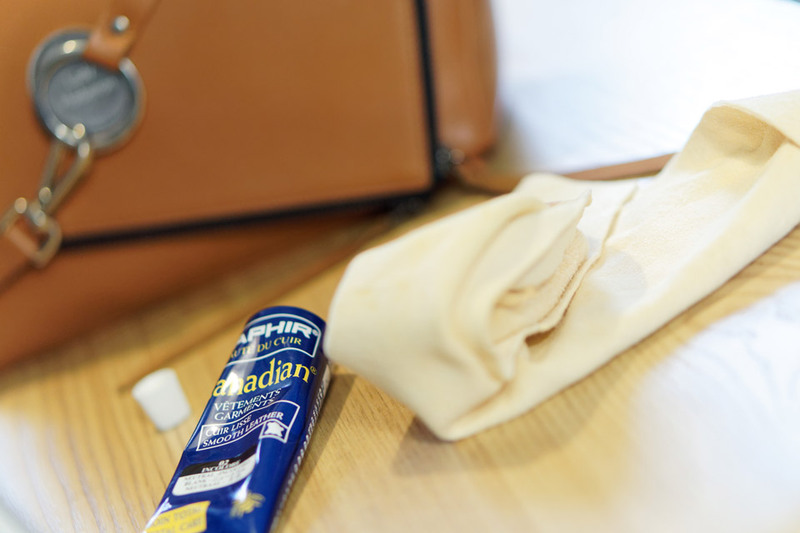 If you get some greasy substance on your bag, we recommend your to remove it quickly by using absorbent paper. Be careful if you want to use “Home remedies”: the make-up remover milk or vinegar that will grease or dry the leather. If you want to use your own product, test it first in a hidden part of your bag. You can also ask your shoemaker. Look at the Messenger bag again ?